Ultimate Rise of the Tomb Raider Experience Features New Story Chapter, New Co-Op Endurance, Limited Edition Art Book, and In-Game Content Honoring Classic Lara Croft Games REDWOOD CITY, Calif. (July 19, 2016) – Crystal Dynamics® and Square Enix® continue to celebrate 20 years of Lara Croft®, the gaming world’s iconic heroine, with fans around the world by announcing today that Rise of the Tomb Raider: 20 Year Celebration™ will launch on PlayStation®4 on Oct. 11, 2016. Rise of the Tomb Raider: 20 Year Celebration will include the award-winning Rise of the Tomb Raider® game, a completely new story chapter entitled “Blood Ties”, new co-op Endurance gameplay, PlayStation VR support for “Blood Ties”, all of the previously released DLC, more outfits, weapons, and Expedition Cards. 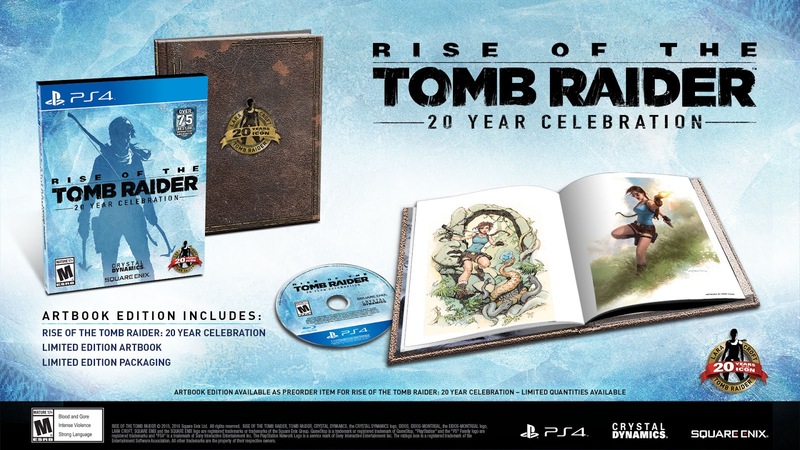 The Limited Edition of the game will also feature a limited edition art book.